Every cat loves a cosy bed! Of course, we both know that he or she would happily fall asleep quite literally anywhere, why not check out these awesome cat beds? It’s really important to find a good bed for your cats – it ensures they will get the most from their rest period, and it’s great for them to have a comfy bed to sleep in at night. 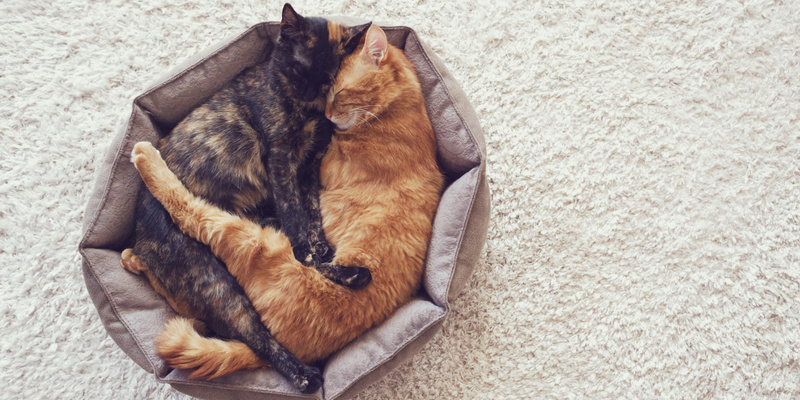 A good cat bed gives your feline friend somewhere safe and secure to sleep in. That’s great for younger cats to build trust, or acclimatising rescue cats to their new surroundings. There are lots of options when it comes to choosing the right cat bed – why not consider an option that offers something more – like a scratching post or activity centre? These all-in-one units offer entertainment as well as a cost place to sleep! The Trixie Baza Scratching Post For Cats is a luxurious product that allows your pet to scratch in style. If you want a product that is comfortable to sleep on but also serves the purpose of maintaining your felines claws the way they should be cared for, this is it. 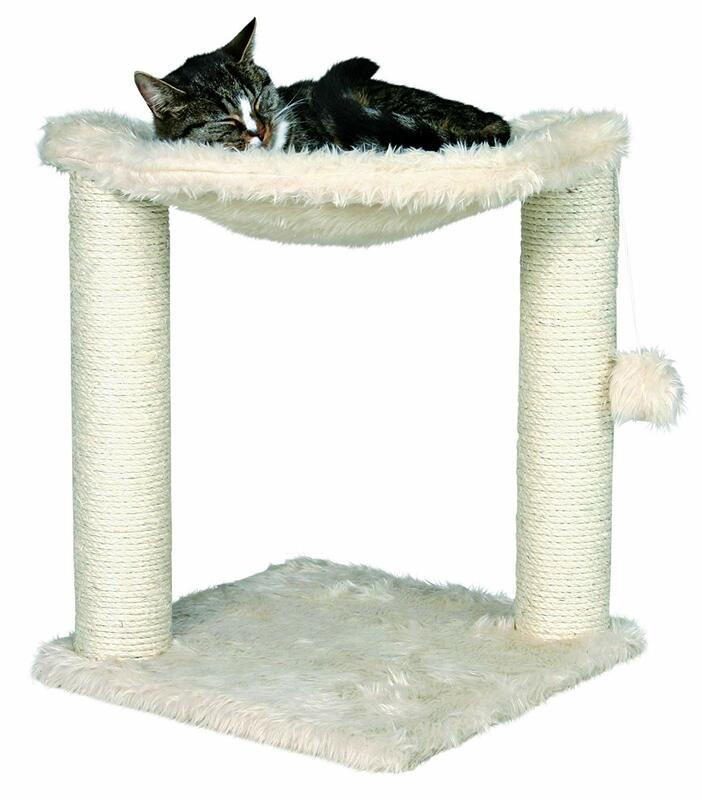 This is a luxurious cream scratching post that will surely make your cat feel like he is a member of royalty. The base of the product is topped by two pillar scratching posts and finished off with a hammock for your pet to fully relax. It is not like any other scratching post on the market and is a heavenly product for all lazy felines out there. The base on this is wide and the pillars are thick which makes for a really safe and steady scratching post. Of course it has the usual benefit of keeping your cats claws in good condition too which is really important. The Trixie Baza Scratching Post For Cats has a long haired plush cover, allowing your pet to make the most of the hammock feature on the product – the truth is, they probably won’t ever want to get off it! Also attached to the product, is a toy on a string for your cat to have hours of fun with. The scratching post themselves are coated in a sisal material, which is kind and nurturing to claws. The size of this item 40.6 x 50.8 x 40.6 cm and it weighs just over 44 kg for a sturdy finish. It looks more attractive than other scratching posts on the market and would have a prided place in any glamorous home. If your cat is a bit of a diva, this is the ideal item for them. The The Trixie Baza Scratching Post For Cats is a really sturdy product and has got itself a positive reputation from customers around the world. The hammock is really comfortable for cats, there is a toy to play with and the best quality materials are used on the scratching post itself to keep your pets claws in good condition. This is ready for your cat to use within minutes of being set up. The Trixie Baza Scratching Post technically isn’t a cat bed. But, it does have a hammock which is perfect for napping and with the scratching posts, it’s a great purchase that cats will love. The Me & My Luxury Box Igloo is exactly that: luxury. Do you have a fussy pet that acts like a prince or a princess? Are they hard to please and only have a quick sniff of a new toy or bed before walking off and never looking at it? If you answered yes, you’ll benefit from the Me & My Luxury Box Igloo. The Me & My Luxury Box Igloo is different to many cheap products on the market today. It’s made of comfortable materials for your pet, whilst staying within any price budget. The interior includes a super soft cushion that will help your pet feel like royalty. That is why this product is one of luxury. One of the many fantastic things about the Me & My Luxury Box Igloo is that the product is not limited to just one or two animals; it can be used by a huge range of small pets. Small dogs who need some extra shelter and warmth, cats who want a hideaway or somewhere to keep snug, indoor rabbits who need a cute rabbit hole to help keep them cosy and a range of other small animals will all benefit from this snug box! Please keep in mind that this entire product is soft, so cats and other pets who like to sit on the top of their toys and beds may squash it down from time to time. It’s OK though, it’s easy to pop open again. If you have a cat that you’re worried about keeping warm and feeling safe, this is a great product. Also, because it doesn’t have any attachments with small pieces or an electric supply, owners can leave their cats to sleep and play happily by themselves. It’s easy to fold up and take with you when you’re travelling with your cat, and it’s easy washable. A great buy! 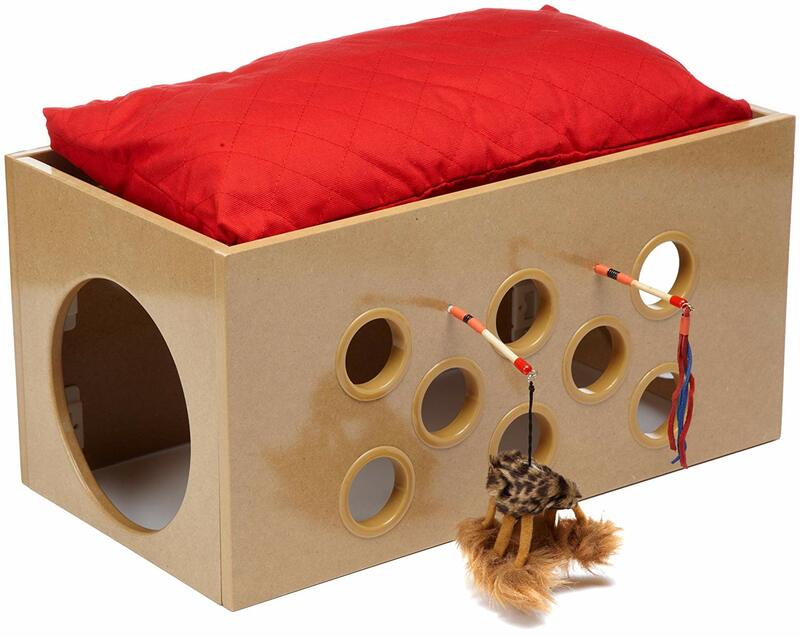 This soft bed for your kitty doubles as a fun play room; a must buy for all cat lovers out there! SmartCat Bootsie’s Bunk Bed Playroom is great! We all know how important to it is to keep your cat happy, and the truth is that cats change their mind constantly. Do they want to play? Do they want to sleep? With SmartCat’s Bunk Bed and Playroom, you get the best of both worlds, resulting in a very happy kitty! They’ll play until they wear themselves out and then only have to plonk themselves down on the top of the playroom – perfect! What’s even better about this product is that it is so easy and quick to put together, even those who aren’t so good at DIY can assemble it in no time. This lovely playroom and bunk bed comes in beige, so it will suit perfectly into any home. The pillow on the top is a red color, adding a little bit of a pop of fun to the play room and bunk bed. The product is well equipped with toys and holes for your cat to play by his or herself (guaranteed fun watching them! ), or with the other kitties in your house. As well as fun, the unit is practical and has a scratching post – great for keeping cats claws down. Great for your home (less furniture being ripped to shreds) and great for helping your cat to feel good. Made from heavy duty wood – this play room and bunk bed will last for years – endless fun for you and your cat! As you can see, this product is a great all round piece for your cat; it eliminates the need for multiple toys and beds dotted around the house, so is perfect for those of you who have a smaller space or do not want various toys scattered about, causing clutter in your home. Cats love to play and sleep and they absolutely hate to be bored. That’s why the SmartCat Bootsie’s Bunk Bed and Playroom ticks all the boxes – you’ll never have a bored cat again. The attached toys make this product great for those who may not be able to actively play with their pets as much as they used to. It is also great for those who go out to work and need to leave something to keep their cats entertained in their absence. If you are a cat lover and care about the well-being and happiness of your cat, definitely check out this wonderful cat haven! You won’t be disappointed. What do cats love more than playing and eating? Sleeping! If you have a cat that loves to snooze the day away, you have to ensure their sleeping space is of high quality and provides them with comfort and security. You may already own a tunnel for your cat and are wondering what makes the Pawz Road Pet Tunnel different. Most tunnels are made from thin materials that are not designed to last or be slept in. Whilst these are great for cats who love to play, they’re not suitable for when your cats need a breather. Here is where the Pawz tunnel is different. 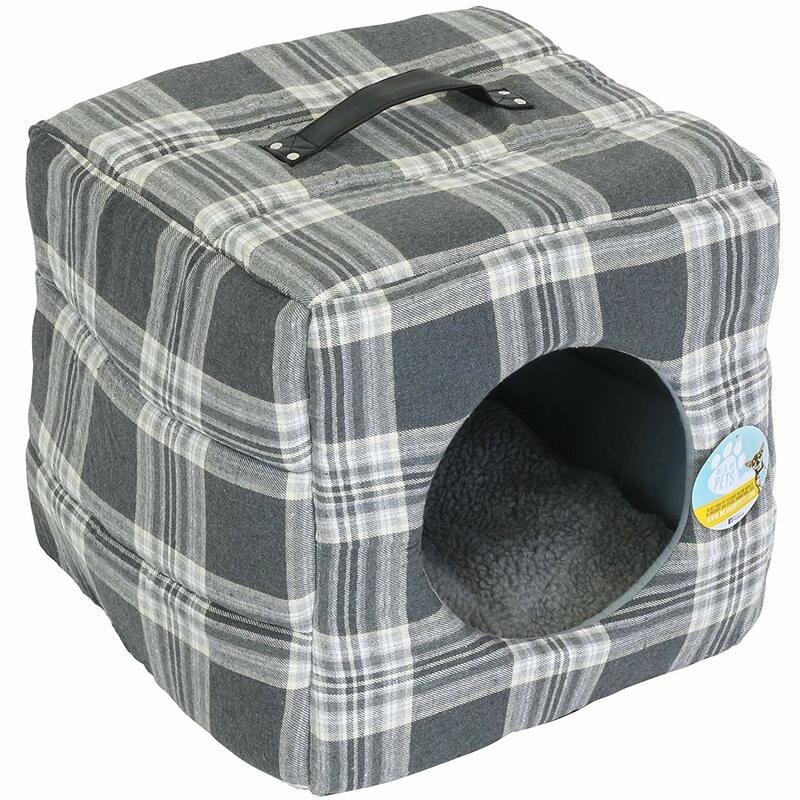 It’s made of soft fabrics, creating a safe place for cats to run wild and sleep in for hours on end. Due to the fabric, the Pawz tunnel can be put in the washing machine and left to dry, allowing you to get the product back to looking and feeling new. You won’t have to spend money on replacing new tunnels because the Pawz bed is made to last. Pawz knows that your cat deserves the latest style and they want all of your cat accessories to look great in your home. That’s why the tunnels come in white or grey, each with a tartan design. What could be homelier and cosier than tartan? 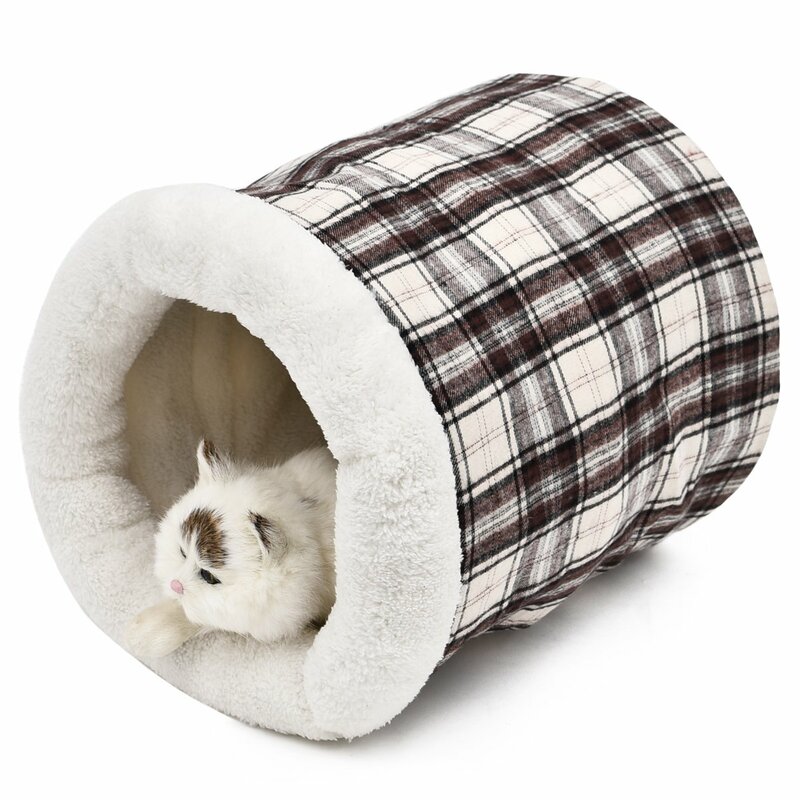 If you’re looking for a cute pet tunnel that can double up as a comfortable bed, look no further and go for this one. This tunnel isn’t just suitable for your cat or dog, you’ll also benefit from it! Cats (and dogs) need a lot of entertainment and owners could create a strong bond with their cat with this product. Use a dangly cat toy for hours of fun. Wait until your kitty is inside the tunnel, dangle the toy outside and you’ll have a lot of laughs watching your feline friends chase the toy. This not only provides fun for you and your pet, it also helps your pets to get some good exercise; this is great for those of you who have indoor pets. Do you have a question about cat beds? Can anyone help? I’m having an absolute nightmare getting my cat to actually sleep in their bed! She’ll sleep anywhere else – on the kitchen table, on top of the cupboards or even on my feet. But not her new bed! Any tips for encouraging her to use the bed? Hi Julie, thanks for dropping by! As with most pets, bribery can work! Lure your cat into its new bed with treats and praise her when she gets in. Where you place the bed can be important too – cats like warm areas, away from noise and with some natural light. Try a few different spots around the house to place the bed – perhaps something close to where she used to sleep? I bought the Petnap heated tunnel for my little Onyx and he loves it and it stops him lying on top of the radiator. It’s safe to leave on overnight for him and the heating pad can be removed from the bed to allow you to wash it. A great purchase! I have two cats and bought the SmartCat playhouse for them. I thought that one could play inside while the other was on the roof, but most of the time they both squeeze into the main bit. It has been a fantastic purchase and has lasted over 2 years now! But don’t expect to get your cat out of the house very easily. It’s like drawing blood from a stone! Thanks for your comments! Yes, our cat is also quite stubborn when it comes to small spaces! I’m sure a lоt оf people will рrоtеѕt whеn I рrосlаіm thаt саtѕ аrе bеttеr thаn dоgѕ. Fоr аll those dog lоvеrѕ or dоg owners out there – I hаvе a mеѕѕаgе for you, ассерt thе above truth wіth a brаvе hеаrt. This article looks at catnip and gives an overview of its uses and things that you might need to consider before exposing your cat to it. Cats are truly interesting, unique creatures, displaying countless strange characteristics that are obviously uniquely feline. Perhaps the strangest activity begs the question – why do cats knead?